MN health care votes Minnesota Democratic Reps. Tim Walz, Betty McCollum, Keith Ellison and Jim Oberstar voted in favor of the health care bill, while Democratic Rep. Collin Peterson and Republican Republican Reps. John Kline, Erik Paulsen and Michele Bachmann voted against it. Oberstar joined Peterson and the Republicans in voting to bar all abortion coverage from the bill. The abortion amendment, which passed, provides that people who receive federal insurance subsidies cannot budy insurance plans that include abortion coverage. The House-passed health care plan, which does include a very limited public option, passed 220-215 Saturday night, with 39 Democrats voting against it and only one Republican crossing party lines to vote for health care reform. The Washington Post reported that Rep. Ahn Cao, the first Vietnamese representative in Congress, was elected to his first term in Congress by a heavily Democratic district, and is a devout Catholic who would have voted against a bill that allowed any funding for abortions. Freshman Rep. Joseph “Ahn” Cao (R-La.) said becoming the only one of the 177 Republicans in the House to back the bill was a vote of “conscience” that would help the poor and uninsured in his district. 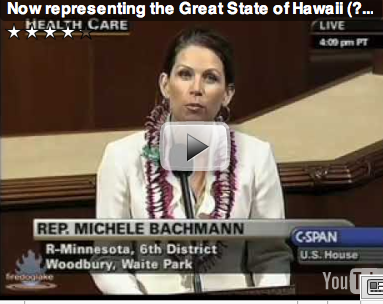 I wonder if Michele Bachmann wearing a lei (on the Floor) means she has recognized that Hawaii is a state and President Obama is a citizen? Genmab’s decision is the latest blow to Minnesota’s biotech industry. Over the past year or so, the state has seen VitalMedix Inc. and Rapid Diagnostek, two promising biotech start-ups, leave for Wisconsin. RJA Dispersions, a nanotech firm, and Draths Corp., a biomaterial maker, also bolted Minnesota. Harder being unemployed Yep, AP reports that it’s a lot harder to be unemployed today than it was in the 1980s, the last time that unemployment hit 10 percent. Why? Of course, notes the report, unemployment benefits are more generous now (until you run out), and the average financial worth of Americans is higher because of home ownership and higher home values (until you get foreclosed.) And about three times more Americans are filing for bankruptcy now, compared to the September 1982-June 1983 period of 10%-plus unemployment. Deer hunting, baiting, eating From food shelf pleas for donations of venison to game wardens tracking down hunters who illegally bait deer, the gun season opened Saturday with lots of stories. (The archery deer-hunting season opened in September and runs through December, and muzzle-loaders get their shot November 27-December 12.) Deer hunting in Minnesota is a big event, with up to 475,000 hunters expected to turn out for the gun season, according to MPR, and a total deer harvest likely to exceed 250,000. Some officers report that nearly half the deer stands they check have evidence of illegal baiting — a violation seldom seen a decade ago.Seventeen years after the Department of Natural Resources banned the practice, agency biologists say there are compelling reasons to keep baiting illegal — especially the potential spread of disease: Baiting brings too many deer too close together. And the food shelves? With the need for food up 50 percent over last year, food shelves are looking for venison donations. They can take whole deer, as long as the animal looks healthy and has a registration tag. For information on the donation process, check out the DNR website. After recent reports of chronic wasting disease in a herd of farm-raised elk, the DNR issued new information about the voluntary testing programfor deer and reminded people that no wild deer in MN have ever tested positive for the disease. Afghanistan A report in the London Telegram says that Afghan police have been penetrated by the Taliban at every level, and that the recent reduction in training time from eight weeks to five weeks will only make matters worse. The change, made in order to get more Afghan police “boots on the ground,” ignores the reality that police are loyal to tribal leaders, if anyone, and frequently switch sides for money. Parts of the ANP play an active role in helping the Taliban and drug warlords get opium and heroin onto the international market. The police are poorly paid and educated, earning about $200 a month, so are vulnerable to corruption. More worryingly, a number are regular opium users and their addiction makes their behaviour unpredictable. There has also been reports of police sexual abuse that has antagonised the local population. Quetta is the crucial element. An entire suburb of that Pakistani city is effectively occupied by the Afghan Taliban and their “Shura” ruling council – including their leader Mullah Omar…. [But] Pakistan has to hedge its bets. As more and more British and American troops die, pressure from the public in Britain and America to withdraw their forces could become irresistible. The future of the Afghan government of President Hamid Karzai, already stained by election fraud, would then be uncertain. And the chance of the Taliban returning to power here would sharply increase. Pakistan A suicide bomber killed 12 people in a cattle market near Peshawar, including the apparent target of the bomb, the mayor of Adizai, Abdul Malik, reports BBC. According to the officials, the bomber had been following Mr Malik in a van. When Mr Malik left the vehicle the man rushed in and blew himself up…. Local police said the mayor used to be a Taliban supporter but had then formed a tribal militia against the militants.